American singer Justine Skye seems to still have a thing going on with Nigerian international superstar Wizkid. 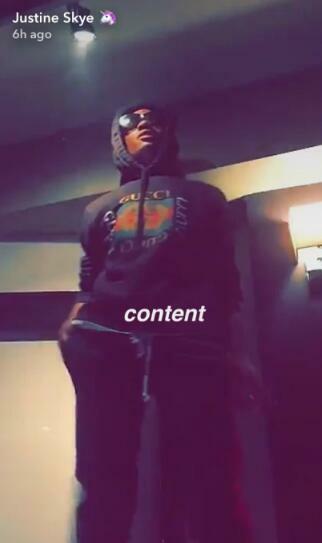 On her SnapChat yesterday, Justine Skye hung out with Wizkid during a photoshoot and brought him a birthday cake. Earlier she indicated that she was going to have dinner with him before his birthday which is today. Who knows she might just still be with him as we speak. 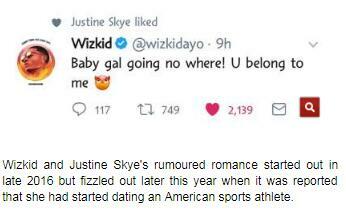 Justin Skye recently liked a Wizkid tweet which has since been deleted. In the tweet, Wizkid wrote "Baby gal going no where! U belong to me" then added a devil emoji. Wizkid and Justine Skye's rumoured romance started out in late 2016 but fizzled out later this year when it was reported that she had started dating an American sports athlete.